COLLEGE of St. Benilde completed its rise to the top of the NCAA women’s volleyball tournament, overcoming thrice-to-beat San Sebastian with an impressive four-set win on Thursday at The Arena in San Juan. The Lady Blazers scored a 25-22, 25-23, 22-25, 25-22 win in their fourth match to cap their impressive season after going through the stepladder semifinals. Janine Navarro ended her collegiate career by bagging a gold medal, scoring 18 points in the final match as the Lady Blazers turned back the SSC belles, who entered the finals unbeaten and needed to win only twice to claim the title. Ranya Musa scored 17 markers, including the title-clinching attack, while Finals Most Valuable Player Jeanette Panaga had 16 points for St. Benilde. 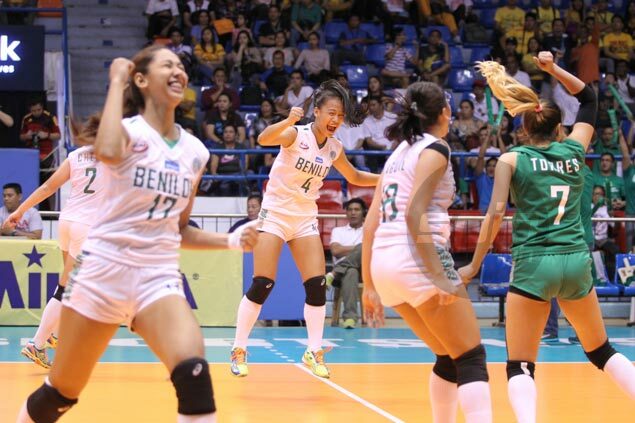 St. Benilde claimed its first-ever NCAA indoor volleyball title since joining the league in 1998. “Sobrang sarap kasi dumaan kami sa butas ng karayom. Ito ang pinakahihintay ng CSB community na mag-champion kami at nagawa namin,” said third year coach Macky Carino. CSB won the opener, 24-26, 25-21, 25-19, 25-13, and the second match, 25-23, 21-25, 25-22. San Sebastian forced the decider with a 25-22, 25-19, 26-28, 25-23 victory on Tuesday. “Hindi sumuko ang mga players kahit gaano kahirap para sa eskwelahan nila,” said Carino. It was sweet revenge for St. Benilde, which bowed to San Sebastian in three matches in the 2009 title series. Season MVP Gretcel Soltones scored 19 points with 18 attacks, while Nikka Dalisay contributed 10 markers for San Sebastian.